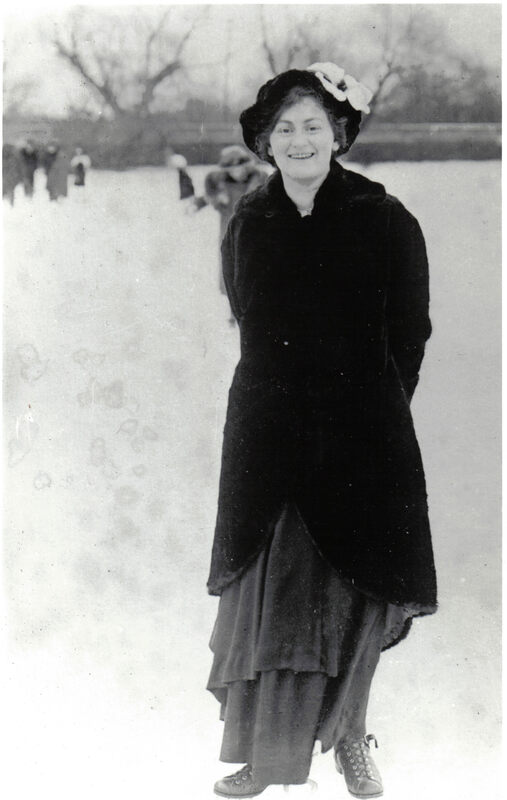 Ida Fingerhut, skating at Central Park in New York, circa 1910. “Grandma, tell me a story.” I was six years old. 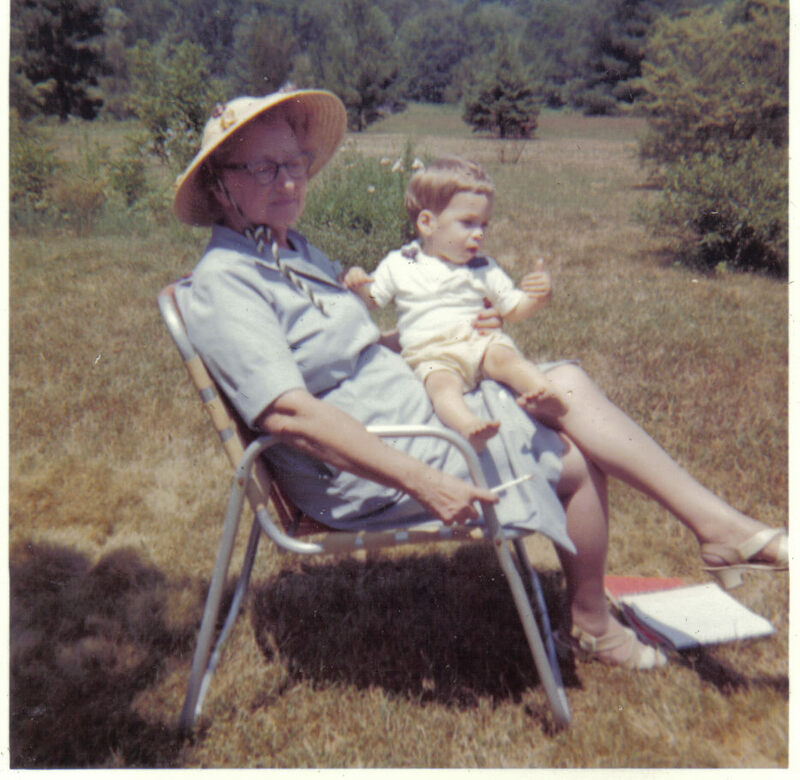 My mother’s mother, Eda Hoode Sadler, sat in her comfy chair, reading. She looked up, distracted for a moment and then smiled. She placed her book on the coffee table, took her glasses off and then gave the familiar pat on her lap. I climbed up and heard her groan as I settled in. How many times had I asked her for a story? How many times have I wished I could go back and hear her words that are lost forever? Within a year and a half, she was gone. Eda Hoode Sadler with grandson, Fred Burwell. Note pad on grass and pencil in hand, ready for a writing session. 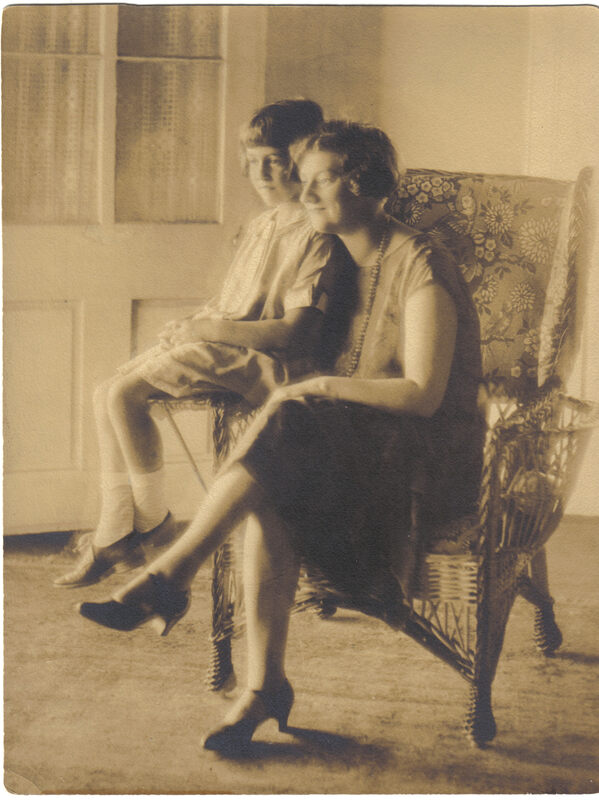 My grandmother’s life included more twists and turns than most plot-driven novels, but she didn’t talk about her eventful childhood. She told tales of magic and mystery. I remember an underwater world visited by two children – my age, of course – and populated by clever porpoises and other wild creatures. As much as I craved her stories, Grandma always made a deal. “I’ll tell you a story and then you tell me one,” she’d say. And so, from early on, I had the notion that you could pluck a story from the air. Even in her mid teens she knew that to get ahead in the world, to get out of the tenements of the lower east side of New York, she would have to hide her background, even change her identity. While at Brentano’s, she learned to type, and she learned the old-fashioned Pitman method of shorthand. She became a topnotch stenographer, working her way up through jobs at banks to a position with New York City Chamberlain, Henry Bruere, a charismatic man who helped mold the new Ida, teaching her proper deportment and even helping her shave off all traces of a New York accent. She became involved in some of the issues of the day, helped found a stenographers union and hosted a suffragist tea. She also married Dr. Herman Seidler, a troubled man with a voracious passion for the arts – music, theater and books. Their marriage ended in separation and divorce and Grandma brought up my mother on her own, making a good living as a career woman. She also changed her name. From Ida Fingerhut to Eda Hoode to Eda Seidler, to Eda Hoode Sadler. 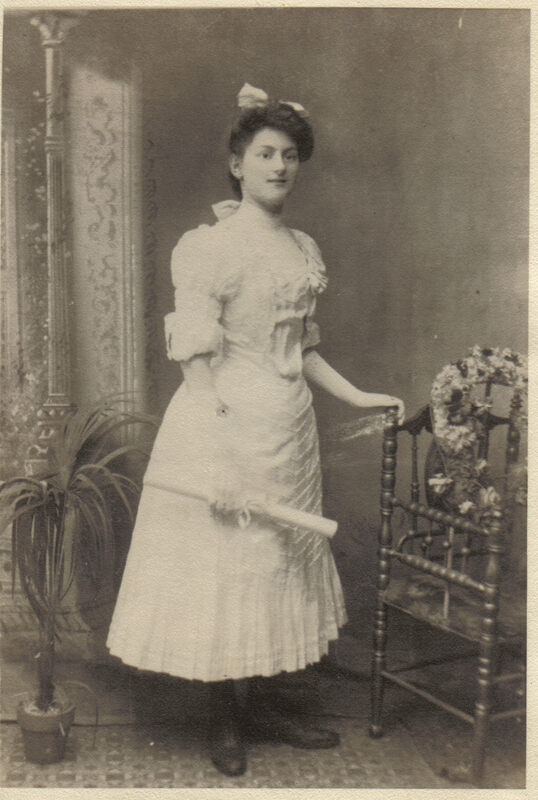 She followed no religion and rarely if ever brought up the fact that she was Jewish, although she had Jewish friends. “See, Mother went a whole different way,” my mother commented. “She became something else completely than what she might have, because she didn’t follow any of her background.” She claimed that she didn’t know any Yiddish and yet in unguarded moments she’d drop a Yiddish word or phrase into conversation. Tucking my mother into bed at night, she’d sing songs from the old country, remembered from childhood. At some point Grandma began to write. Perhaps her success writing advertising copy spurred her on. Or perhaps Peeps and Conundrum had something to do with it. She took courses on the short story and attempted to tailor her pieces for the slick women’s magazines of the day, without success. By the 1950’s she was working on Jessica Brown, a long novel based on her own life. She entitled a shorter version, Lamplighter Days, which focused on rich details of her childhood. Her literary agent and friend, Bertha Klausner, sent them out and they received “positive rejections.” Publishers found them “charming” and “delightful” but too old-fashioned for changing times and so the aging manuscripts sat for decades in a desk drawer and then in cartons. They moved whenever we moved and today they reside in my Wisconsin study, awaiting rediscovery. 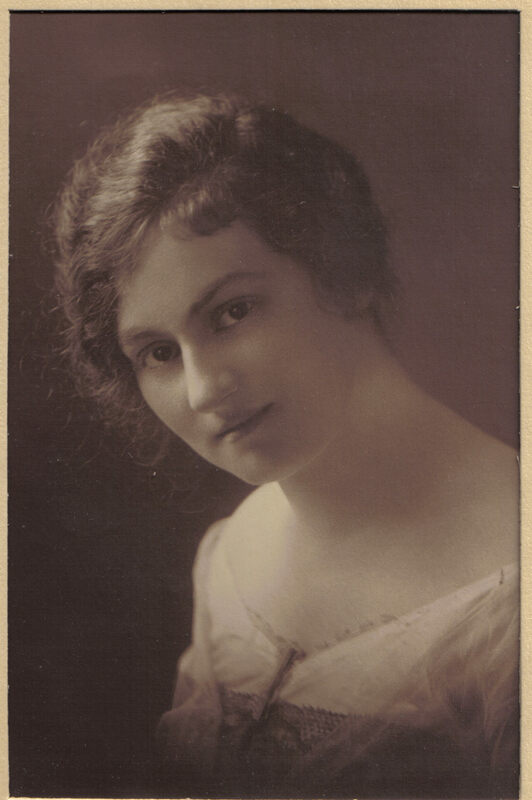 In loving tribute to a spirited member of my “writing family,” I post the following excerpt from Jessica Brown, a work by Eda Hoode Sadler which shows that Ida Fingerhut, an identity so long discarded, wasn’t so far below the surface after all. The employment office was crowded with men and women whose faces showed worry, hope or resignation – anything but expectancy. For the older ones, with their firmly pressed lips that had thinned and puckered with the rancid taste of their lives, Jessie felt pity rise in her and a vague sense of guilt for her own advantage of youth. The printed application blank appalled her. So many questions, so many vacant lines like hungry mouths that she must fill with bits of herself. The print swam in a jumble before her apprehensive eyes, and to steady herself she looked around, then back to the shabby long oak table at which she sat. A girl opposite her was writing industriously, with no hesitation, as if it were all a familiar process, her dark hair neatly coiffed under a small-brimmed blue hat that matched the color of her short tightly buttoned jacket out of which billowed a white frilled jabot. She saw the girl suddenly hesitate, lift the paper in well-kept square-tipped fingers as if to tear it, her dark face taking on an angry frown. What made her angry? Jessie wondered, and glanced over the form before her. “Why did you leave your last place of employment?” caught her eye. Because – stop it, Jessie, she warned herself. Stop it or you’ll cry. Get to work. Begin at the beginning. “Age.” She hesitated and glanced up. The girl opposite her was at least twenty-five. Everybody seemed older. If she said seventeen they would think she was a beginner. Nineteen, she decided. “Experience.” Think of the experience and see how it adds up. Four jobs in the first six months. No, that would give an impression of instability. Just the last job would be better. Two and a half years on the last job. She could be truthful about the job. Her eyes followed the girl as she rose and went over to the clerk. What a lovely suit she wore, how trim and business-like she looked. “I’ll take anything,” the girl interrupted. Jessie averted her eyes from the girl’s bitter face as if she had been caught peeping into the privacy of her room. Surprise and fear, like a sudden spasm, cramped her stomach. Names made a difference! She looked down at the application blank. Jessica Brown. The name she had been given in school by some indifferent clerk suddenly seemed fraudulent. But lots of foreign names were changed in school, were accepted as the first step in Americanization. That’s the way even mama had taken and used the name. Now Jessie felt a sense of disloyalty to her father, a sense of shame as if she were being dishonest. And yet she felt grateful for its anonymity, as if it were a shield against an enemy. Saul’s voice echoed in her ears while she stared at the word “Religion” until each letter formed iron bars closing her in, imprisoning her. Saul’s words beat at her with hammer strokes. “Be what you want to be!” He had believed in the freedom of America. “Freedom and opportunity are your birthright!” He had been willing to starve for that belief. If she let herself become a prisoner of prejudice, she would betray all his hopes for her, his faith in the country of his adoption. And mama. Mama’s eyes were afraid. Remembering the fear in mama’s eyes, desperation filled Jessie. Shutting her eyes for a moment as if she felt the impact of the word as a blow, she wrote “Protestant,” then sat frozen and grieved. “Are you ready?” The clerk’s voice cut sharply into the fog of her distress. Others waiting…Mama waiting, frightened, remembering the early days after papa died. Mama must never know such need again. Stiffly, Jessie handled over the application blank, and waited. It seemed to her that the clerk glanced at one item only. Jessie nodded. It was more than she had hoped for. It would take care of mama and herself. Mama would not have to draw on her last few dollars. She would no longer be haunted by fear. But Jessie found no satisfaction in the thought. Her throat was parched. She felt empty of all emotion save a sense of shame for herself and for the country she grew up in. “All right. Here, take this card. You’ll like the people, and you’re just the kind of girl they want,” the clerk repeated. I’ll hate the people, Jessie thought savagely. I’ll hate them. I’ll never be happy with them. And I’ll never forgive them. Lithomarge: [see also, lithobutter] a print produced by lithomargraphy, a process in which one renders an image or word via rendered margarine on non-absorbent pastry which repels the ink, allowing it to rappel onto an appropriate surface or external locus, ostensibly providing a subcutaneous veneer, although a few (jealous – or zealous? I can’t read my own handwriting) scientists in Monaco doubt its plausibility. Long, long ago an itinerant Italian artist and printer named Graphias Litho sat down at the breakfast table with a hefty chunk of Tuscan flatbread and a pot of well-congealed butter. He was an absent minded fellow, given to flights of fancy and flights of forgetfulness. That day, knife in hand, he was about to slice into the flat, smooth crust, when without thinking a thought, he carved a word in his native language, “buffone” or “buffoon” as we call it today. He then pressed the bread against the creamy butter, while simultaneously spilling a quantity of ink which he’d mistaken for wine. When he lifted the bread, he cried, “Voila!” Or, rather, “Ecco!” There was “buffone” spelled out in lovely burgundy-colored letters. Sadly, the newly invented “lithobutter” had a very short life span once the Tuscan sun – and Graphias’s wife Petra – heated up. Petra was quite upset to find ink mixed into her butter and threatened to use Graphias’s printing press as kindling. But the germ of an idea grasped Graphias and spun him around. Once he stopped spinning, he began the art of lithography in earnest. Flash forward two centuries and an Armenian avant-garde scholar/artiste named Plebiscite Philagorean spent two hundred days in the Litho room of the Benedetto Archives of Siena, Italy, pouring over Graphias Litho’s papers, which included original lithographs, baffling treatises on befuddled subjects (unless it was the other way around), and mysterious ink-stained notes, as well as assorted crumbs from long ago meals. One day he stumbled upon a still slightly greasy jotting about Litho’s initial discovery of the lithobutter process. A light bulb lit above Philagorean’s head, although that was not unusual. Lights were always flickering on and off at the Benedetto Archives, which along with its fabulous collections, featured faulty electrical wiring. Plebiscite Philagorean raced back to his hotel room on the Rue de la Champagne (for some reason he was commuting daily from Lac Dumas aux Flambeau, France, 750 miles away), not forgetting to pick up the flattest, hardest, three-day old bread he could find. He rummaged in the refrigerator for a plastic tub of margarine and then set to work. To honor the Italian Graphias Litho, Philagorean carved the word “vermicelli,” a type of pasta also known as “little worms.” He pressed the bread word into the margarine and stared in disbelief at the faint, spectacularly unspectacular imprint. He’d forgotten the ink! Hurriedly he pulled apart a BIC pen and squirted it all over himself. Fortunately, enough ink dripped onto the bread that he was able to try again and this time the word stood out a vibrant blue. The art of the lithomarge, created by way of lithomargraphy, was born and the world was never the same, although the world didn’t know it. Actual definition: smooth, compact kaolin, a type of clay used to manufacture porcelain. My novel Prairie Hill takes place in 1980. A plot thread deals with the threat to one of the few remaining remnants of tallgrass prairie. I wish I could say we’re all enlightened now, thirty-two years later. The other day I took one of my favorite walks. 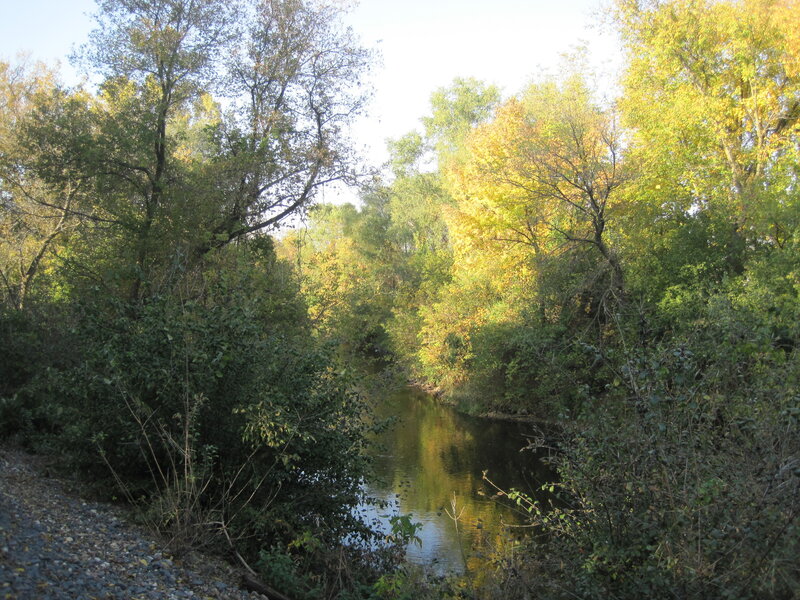 I slipped down the hill behind our house, crossed the flood plain and then climbed the short rise to the railroad tracks which follow the meandering course of Turtle Creek. A few warm days had melted the heavy blanket of snow and the sun tickled the old cap on my head and warmed the tiny insects out for a stroll on their version of a superhighway – the rust-tinged rails of a seldom used freight track. I heard a cardinal singing, the caw of a crow high up in a cottonwood across the creek, and the scolding quacks of mallards fighting their way upstream in a creek churning with snow melt. The gravel crunched as I ambled alongside the tracks. I looked to my right and then noticed something different. Someone or some thing had rudely hacked down the tree where the cedar waxwings like to congregate, calling out there ethereal whistling notes, socializing. It looked as if a giant had reached its hand down and snapped the tree in two. I glanced down the track and saw further destruction – brush, grasses, small trees, all mowed down, discarded on the creek bank or half in, half out of the water. 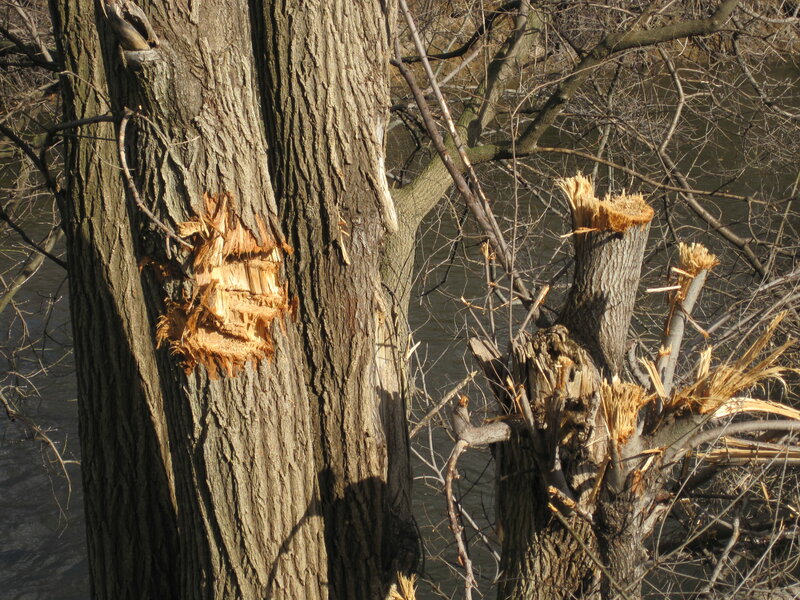 Worse, nearly every larger tree displayed hack marks or great gouges meant to kill. 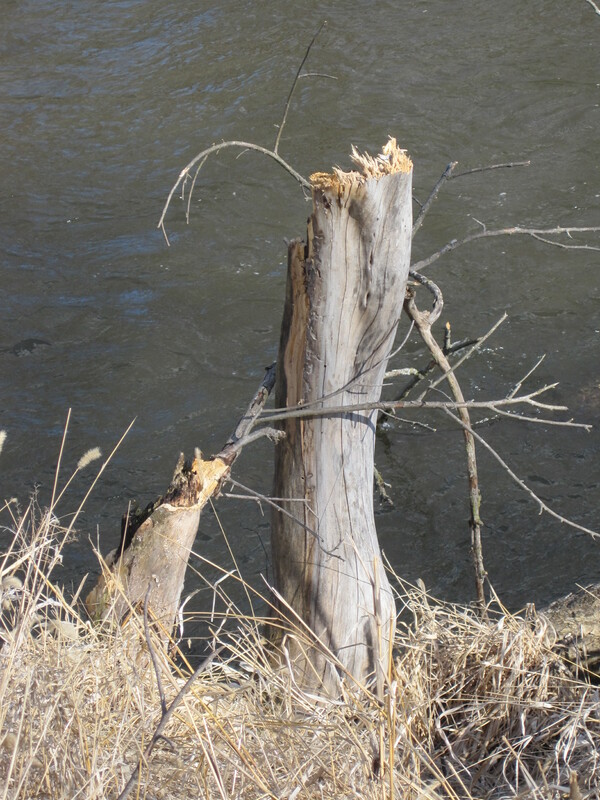 At first, as I walked along, I wondered if we’d somehow had an invasion of beavers – I could forgive the beavers – but it had been years since I’d seen evidence of beaver and even longer since I’d seen the industrious animals swimming in the creek. 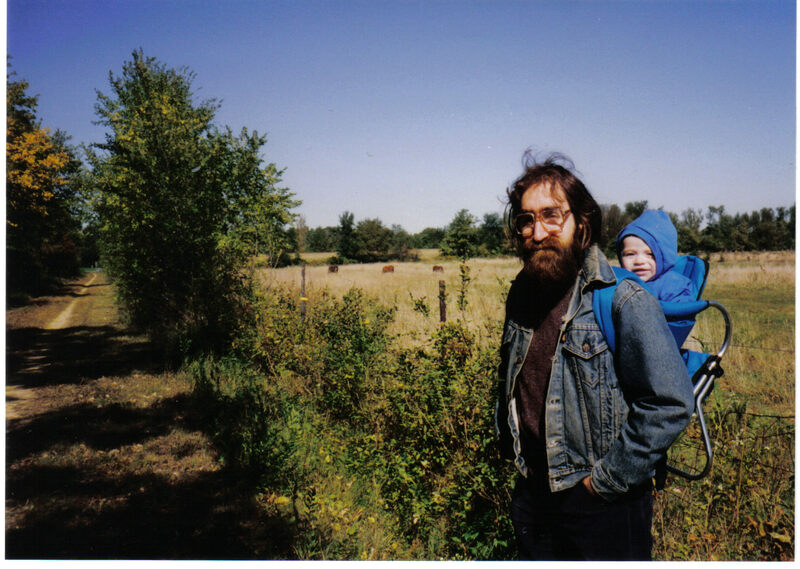 I remember when I first walked the rails, thick clusters of prairie plants on either side, a variety of golden sunflowers, the startling deep, rich, blue of spiderwort, pale pink-petal coneflowers bobbing in a stiff breeze. Best of all, there was a great variety of birds. In early spring you’d hear song sparrows and goldfinches, thrushes and thrashers, and a catbird trying out his best cardinal. One year, as I followed the creek, I suddenly felt as if I had a companion alongside me. I looked over and spotted a ruby crowned kinglet, flitting in the brush. It seemed as curious about me as I was of it and I felt that I’d made a friend. There were also the water birds, shy, skittish wood ducks I could never quite get close enough to before they exploded from the water in a mix of spray and beating wings, and the kingfishers speeding along the creek as if it was a raceway, making their clattering raucous call. Within a few years, I noticed this seemingly forgotten habitat under threat. The railroad people came through and sprayed chemicals on the vegetation, turning it into a wasteland which grew up again until further spraying. The wilder plants disappeared, replaced by opportunistic invasive species such as garlic mustard. Now they’re hacking it all down. I haven’t seen a kinglet in years. I finished my creek walk and headed down Colley Road where I turned onto a fire lane/access path, headed for Leeson Park. This once peaceful, tranquil haven is another favorite walk under threat. So far the privately owned woods to the left remain undisturbed, a refuge for deer, fox, wild turkey and owl. Five years ago you could look to the right and enjoy mixed pasture and remnant prairie. Then the bulldozers tore up the ground, followed by the builders. What appeared? 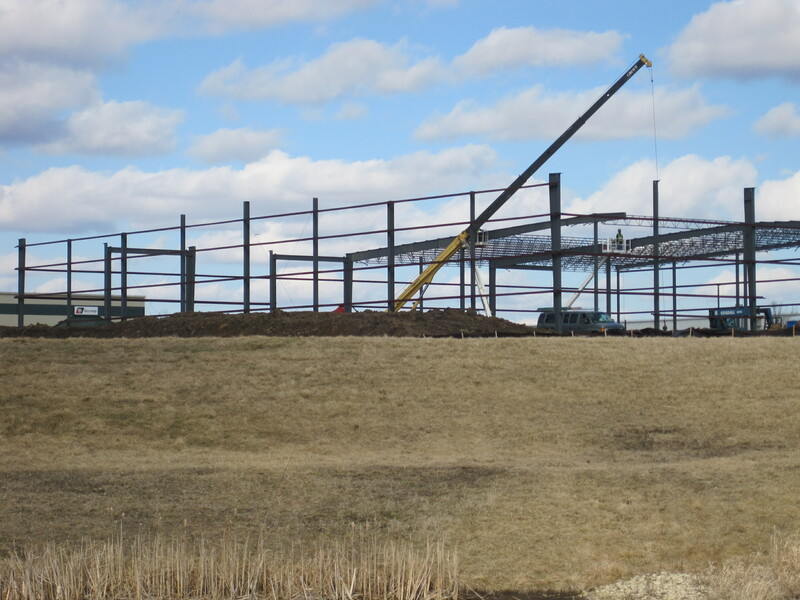 Not a country estate, not an “attractive” subdivision, but prefab warehouses. More than half the field survived initial construction, though its disturbed ground housed rough grasses and the beautiful but diabolical bull thistle. The new retention pond grew smelly, vividly hued algae but also attracted mallards, Canada geese, killdeer and singing frogs I can hear from my house. Now they’re building another round of prefabs and the field is down to a tenth of its former size. Off in one corner someone had a bright idea. 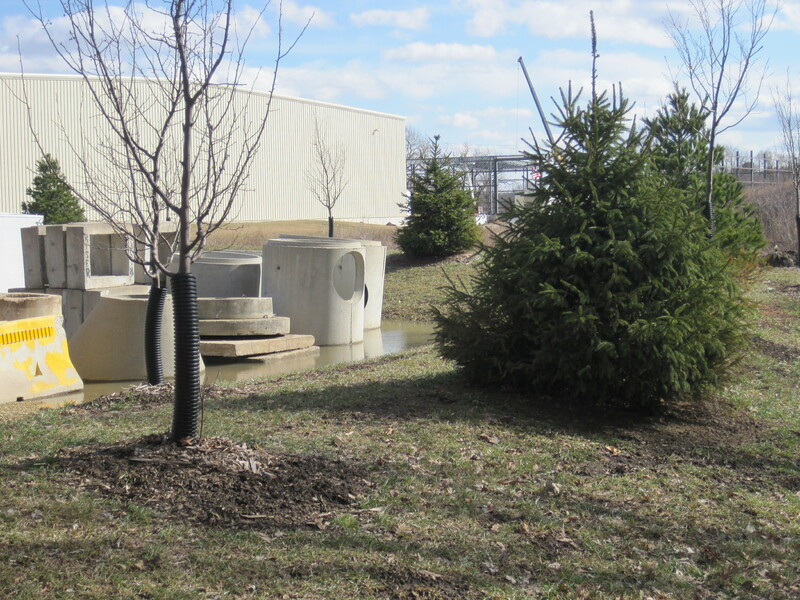 Why not plant a few evergreens on top of an artificial berm to hide unsightly cement pipes? As Hulda would say in Prairie Hill, “It looks downright silly.” Sadly, there’s nothing they could plant to hide the bigger mess they made. Prestidigitator: An instant finger-making machine, not to be confused with a prestoagitator, which is an instant annoying person, not to be confused with a depressedagitator which is an unhappy annoying person. The prestidigitator is useful for creating fingers for things that don’t have them such as televisions and glasses of orange juice. Juan cried, “¡Ay caramba!” when the prestidigitated finger rose like Excalibur from his bowl of steaming burrito soup. Guacamole splattering, corn chips clattering, Juan burst through the nearest mosaic-covered mud brick wall as if it was one of those swinging doors in a fabled western saloon. No one ever returned to El Gordo Sombrero, considered until that tragic day the finest Mexican restaurant in Uzbekistan. 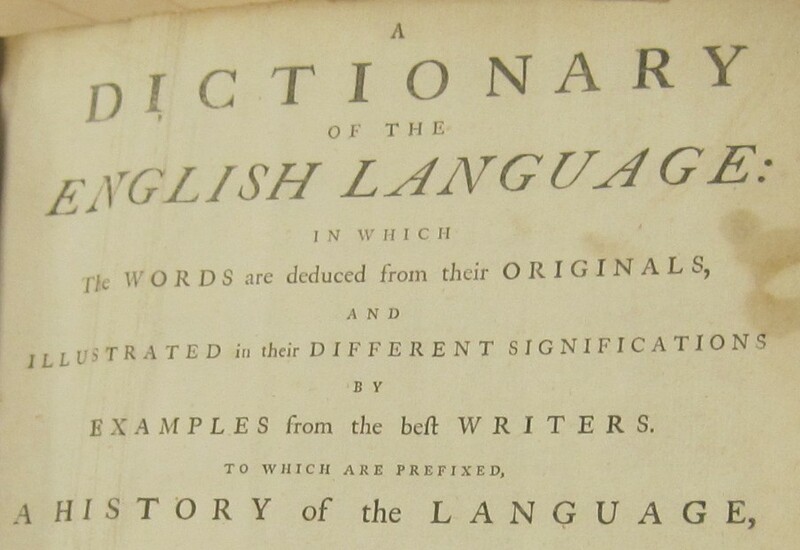 Actual meaning: an expert at prestidigitation, which means sleight of hand. Croquette: A psychological condition in which the subject is only capable of flirting while playing croquet. From the age of two, Helga cried foul over the name her parents chose for her. Why oh why couldn’t they have named her something pleasanter, like Babette or better yet, Bala Cynwd? She tried everything in her power to destroy the grim image her name evoked. Instead of dark, practical clothing, she wore frilly dresses. Instead of short, practical straight hair, she wore her hair in artfully arranged ringlets. Instead of a stern, uncompromising expression, she wore something decidedly inane and vacuous. Her attempts at base flirting, at the normal coquetry of feminine youth, failed utterly and completely until one day while visiting her fourth cousin’s mother in law’s best friend’s neighbor twice removed (no one knew why), she took up the ancient and esteemed game of croquet. The men who played that day, the Italian count, Garibaldi Garbanzo and his sycophantic associate, Garlic Gorgonzola, found themselves fascinated, charmed and captivated. Helga, who despaired of ever marrying, used her new-found croquetry to land both, living happily ever after at the conjoined Garbanzo-Gorgonzola estates until one day a prestidigitated thumb appeared in her linguini. The unfortunate result was the sudden disappearance of her remarkable abilities as the world’s most famous croquette, thus ending a chapter in Heinz Uberburgerschnitzel’s classic tome, Psychotomimetical Psychosomatics. Actual meaning: a croquette is a cake or pastry filled with diced meat and vegetables, coated with breadcrumbs and fried in deep fat.